Guest Post: The Ontario 14 Come to Cleveland! My name is Sandra. I live in Waterloo, Ontario, Canada with my husband and 2 kids. I am a special education teacher and have been running since October 2008. I read many of the 2012 blogs and have been reading the 2013 ones since they were announced. I see some of my friends in the blogs and I see a bit of me in several of them but when reading Jessica’s it really felt like I was reading about me (with a couple of exceptions). Wanting to contact her for months, I finally did after A Running Sweet Sixteen. A new connection has been made and I am thrilled. It’s all thanks to the social media. The idea of coming to Cleveland for the marathon was borne out of the disappointment that I couldn’t join 13 members from my run group going to Big Sur in California because it didn’t jive with my work schedule. I had read about Cleveland and know one person who ran it in 2011. At the expo for Around The Bay (Hamilton, ON, Canada) in March 2012, I chatted with the gals at the Cleveland Marathon booth. They were awesome and said that since the race was on the Canadian long weekend, we (my sister and I) should come. Before the end of the expo, we decided we would take it to our respective run groups and formed a plan. By the time we were done we recruited 12 gals to head to Cleveland with us! We hatched this plan all before the 2012 edition of Cleveland had even been run! We were so committed most of us took advantage of the incredible early bird registration fee and got one sweet deal. Looking forward to the Cleveland Experience has given us something to talk about for a year. We can hardly believe it is right around the corner. Our plans are set: hotel rooms and a charter bus have been booked for months, Sunday evening dinner reservation has been made and the plan to go shopping at an outlet mall on the way home is pretty much carved in stone. Oh, and the training… we finished 34KM last week in unbelievable wind (55km/hour) and have our sights set on the 36KM at the end of April. In between we had the chance to run a couple of races to test our mental toughness and our training. Races are learning experiences no matter how successful or tough. At Around The Bay 30K in Hamilton, ON at the end of March we all travelled together and learned that when you put 7 women in a car sometimes the car ride there and back can be more fun than the race itself! 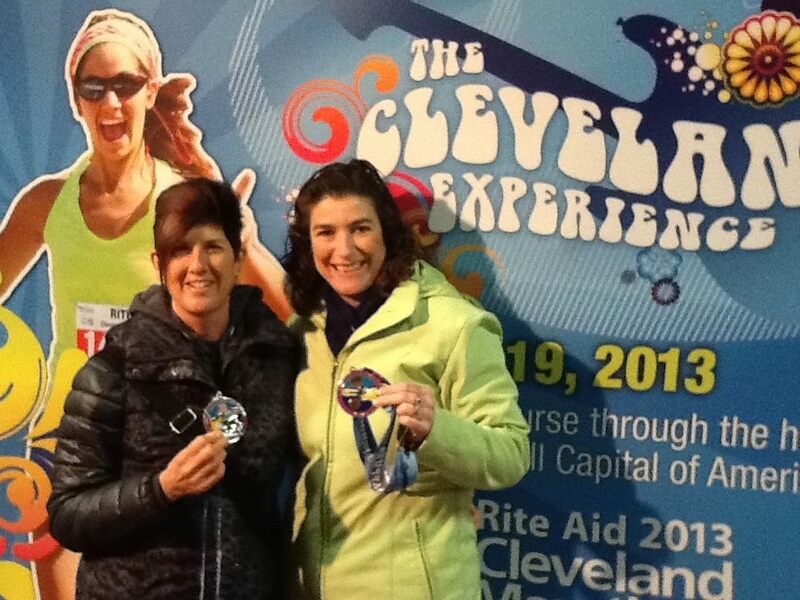 At the 2013 expo for Around The Bay we went to see the Cleveland girls and told them we were coming. They took our picture and posted it on the Cleveland Marathon facebook page. This was a pretty awesome honour for 2 little Canadian girls. When the battle was over on the course and we all crossed the finish line, we stopped at a restaurant closer to home to have a late lunch and a drink. 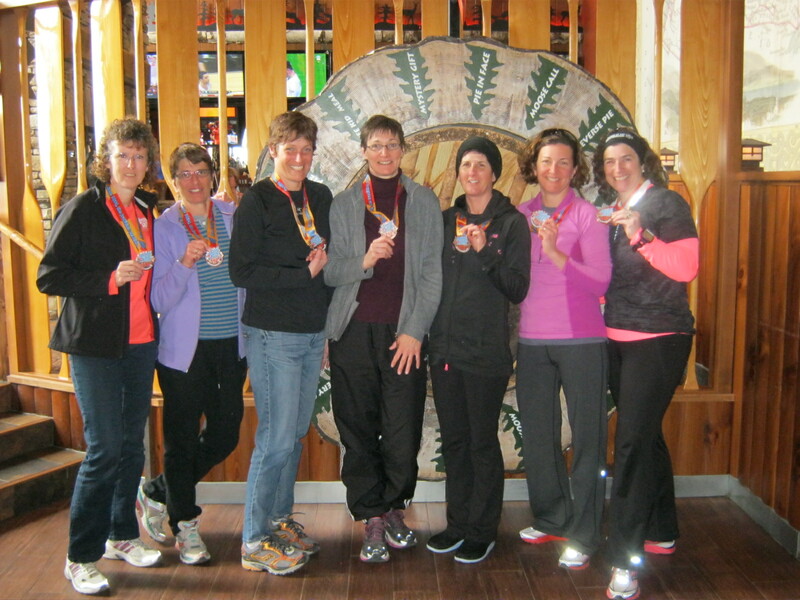 Here are 7 of the CLE bound runners (all doing the marathon) celebrating a 30KM being done. Of the 14 who are coming 7 are doing the half marathon and the other half are tackling the marathon. For 2 of them it will be their first marathon, second for a couple (including me) and third for the rest. We are just so excited to be coming to Cleveland. So, if you see a big group of Ontario, Canada girls riding around in a bus…it could be us! We anticipate the ride to Cleveland and back will be just as entertaining and memorable as the Cleveland Experience!